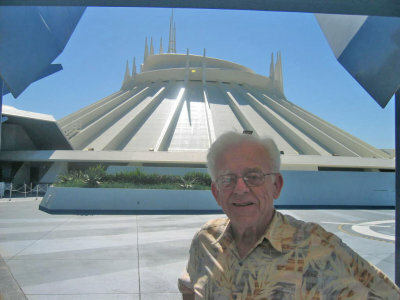 In this multi-part series, former Imagineer George McGinnis and Bill Watkins share their memories of the design and construction of Disneyland's Space Mountain. To see the rest of the series, continue with Part 2 (link) and Part 3 (link). At the July 15, 2005, relaunch of Space Mountain after a two-year refurbishment of track and show, the honored guest was Neil Armstrong, the first man to walk on the moon. Neil spoke of the power of imagination being crucial in both innovations of space and Disneyland. After a tribute to John Hench, the ride was opened to the public, many not knowing, however, that space pioneer Neil Armstrong was sharing the relaunch with them. 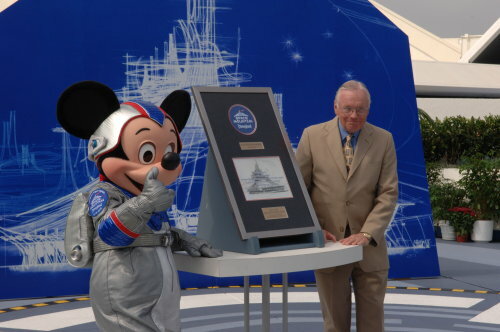 Neil Armstrong and Mickey Mouse unveil a plaque at the rededication of Space Mountain. Photo by Frank Anzalone. As smooth and fast as ever, the mountain's show design and special effects dazzled this old show designer and laid to rest any fears that they could mess it up, a fear that parkgoers expressed to Disney execs when questioned in a recent poll. According to a July national survey, Americans rate the high-speed Disneyland roller coaster Space Mountain as their favorite Disney theme park attraction. The last statement in my Walt Disney World Space Mountain article (link) described Disneyland's Space Mountain project as a classic story of putting more into a space than its stated volume, a variant of 10 pounds of 'stuff' in a five-pound bag. This became evident as the track engineer, Bill Watkins, endeavored to find space for this pure-gravity ride. Indeed, my first involvement with the Disneyland mountain no doubt contributed to Bill's challenge. George McGinnis, Concept Show Designer on both Walt Disney World's and Disneyland's Space Mountains. Photo by Scott McGinnis. 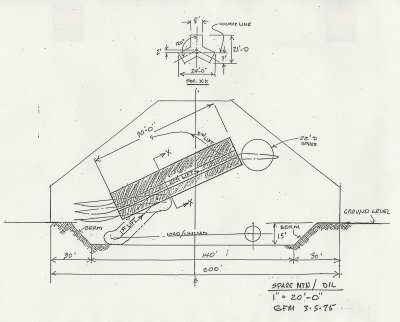 Given the assignment to begin concept design, the first bit of information I received was from the Architecture Department showing a 200-foot-diameter building with a ground penetration of 15 feet. This lowered the mountain's cone to fit the scale of Tomorrowland. 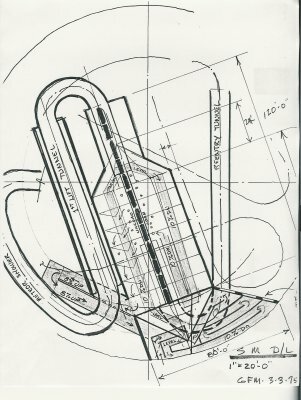 The architect's conceptual plan placed the queue and load/unload area outside the circle of the buildingan arrangement similar to the Paris Space Mountainleaving the entire interior space available for the ride track. At the concept stage there is room for experiment. For efficient use of space in this compact Tomorrowland, I placed the load/unload in the center of the building 15 feet below ground level and brought the queue inside, the idea being that a large part of the queue would be inside in air-conditioned space. A themed Space Port would be created at this level. Then, working with Bill, we laid out three lifts and show concepts to the top. 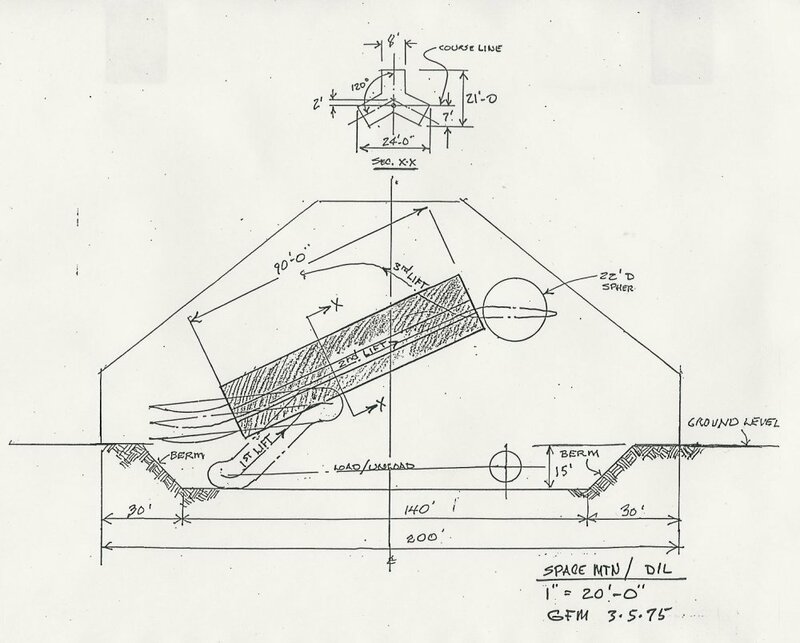 From there, Bill's track would find its way back to the Space Port. Bill accepted this design challenge. 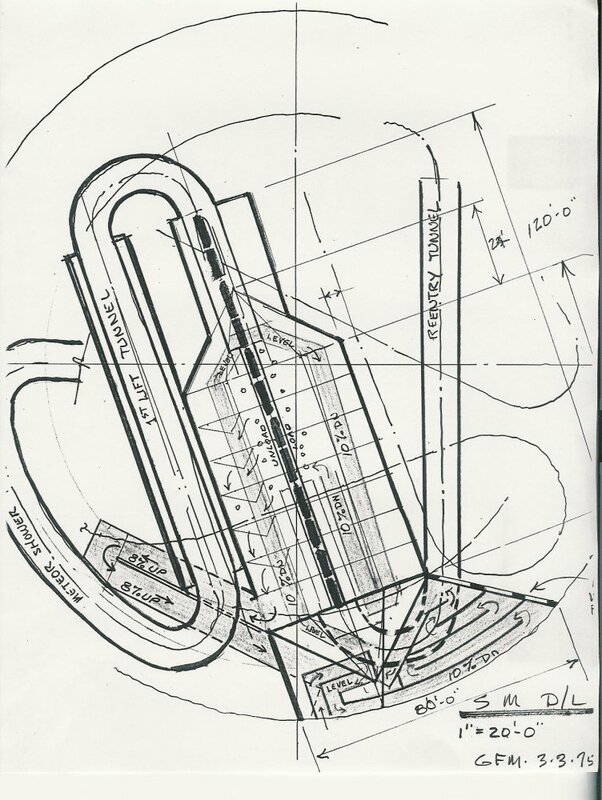 This cross section of Space Mountain defines the space for Bill Watkins' track and some show elements. Load area and the three lifts are shown. The below ground level floor is 140 feet in diameter. The overall building diameter is 200 feet. Conceptual layout by George McGinnis. Click photo for larger version. The show story developed around the theory of Superspace and time-travel to galaxies beyond ours. The first lift was the Launch Portal with flashing warning signs. We then traveled through a meteor shower consisting of fiber optics and strobes, and then to the long lift which I first proposed to be a revolving tunnel to produce the illusion of the vehicle turning over. Rotating cylinders of Dexion (louvered electrical tray material) surround the track, spaced between track supports. Black-light tubes at each side of the track created a red glow through the rotating louvers. 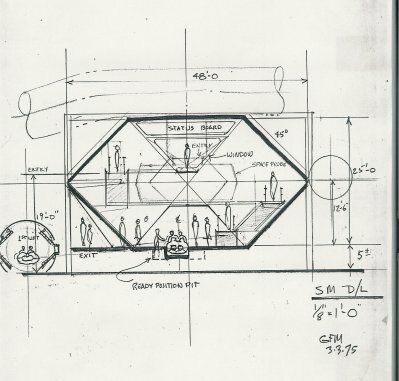 There was a problemthe segmented cylinders would require thrust bearings due to the slopeso engineering suggested relocating the effect to the ride's end for a similar fiery reentry as at Walt Disney World's Space Mountain. Unfortunately, the length of time to perceive the illusion was too short, as it was at WDW. Butas we will learn later in this storythe Revolving Tunnel special effect was not forgotten. This management decision was a disappointment to me, but out of it came the solar energizer tunnel for our plunge into Superspace, the show theme. This special effect used 270 mirror boxes to create an infinity effect of solar collectors in three directionsabove and down to each side. It was an impressive light show, but a static one. A random arrangement of twinkling grain-of-wheat lights were added behind the mirror boxes. Had they appeared to have an electronic connection to the solar panels they would have made more sense. This effect operated for a period of time but was then turned off, possibly due to the large energy usage. It was replaced by a projected revolving stream of light aimed from the top of the lift at the ascending vehicles, again trying to create the illusion of the vehicle turning over. Special Effects Designer Mort Heilig was responsible for this effect. 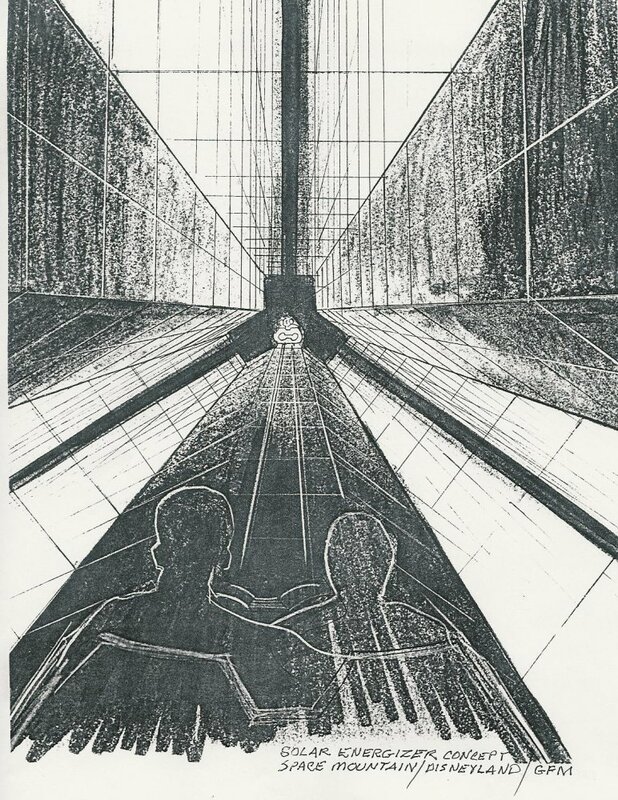 Upon entering Space Mountain the guest is enveloped in a huge space frame corridor. Surrounding it is endless starry space. A large gaseous nebulae and a geodesic satellite are major show effects visible overhead. Also, numerous space vehicles darting high and low throughout are visible due to their glowing side panels. A very close fly by of a space vehicle gives the guest a quick impression of the nature of the ride. This early concept for the Space Port locates it on the floor of Space Mountain. Guests enter the building at approximately 30 feet above the vehicle load position. Ramps along the walls bring them to the load position. The queue leading to the Space Port is a virtual planetarium show with spaceships zooming by observation windows. Conceptual layout by George McGinnis. Click photo for larger version. This giant field of solar collectors charges our spaceship for the penetration of Superspace, taking us to another galaxy. The Superspace theory was popular in science fiction at the time of Disneyland Space Mountain's creation. Based on quantum theory, it predicts a network of bridges and wormholes for travel to other galaxies. So, the Interplanetary Explorer in Walt Disney World's Space Mountain became an Intergalactic Explorer in the second Space Mountain. Conceptual layout by George McGinnis. Click photo for larger version. The queue became much larger than shown here between March and October. The observation port location changed and the PeopleMover traveled on a track above the queue to view the starry field of spaceships high and low. The support structure for the PeopleMover had to be much beefier than the light space frame I had envisioned surrounding the queue. Conceptual layout by George McGinnis. Click photo for larger version. Jim Hill (of Jim Hill Media) had some fun with this story. Apparently it was used in the Space Mountain Preview Center's narration describing the visuals in a sequential manner. Quoting Jim, "...I mean, I was really kind of shocked to discover that Space Mountain's designers really had worked out some sort of a storyline for this attraction...." Jim's point is, no one gets the story. Of course this "story" had one purpose, a theme for Space Mountain's interior. But, Jim is right about rides, they are not good story telling devices. Often what they do best is give impressions. (Carousel of Progress is an exception, being both a ride and a theater.) The Horizons ride/show had three impressions: Past, present and future. If the guest brought knowledge of the family from the Carousel of Progress, the future scenes would have much more meaning, not just people living in exotic environments. The concept stage on Disneyland's Space Mountain lasted six months, with Bill and myself collaborating on all elements of the ride/show. 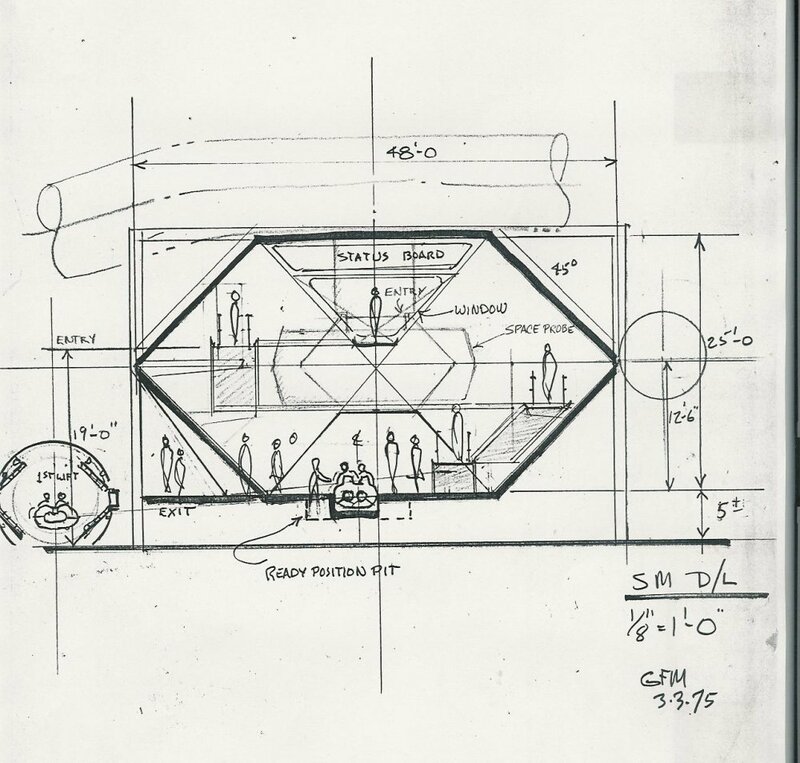 With no sponsor, I felt there was no need for large renderings as were done for RCA at WDW, so all show concept illustrations were marker sketches on small boards, (not shown in this article) giving me time to do very complete models for John Hench and others to review. The model shop was preparing an alternate design of the Space Port under the direction of the Architecture Department. John Hench and Marty Sklar reviewed the two models and they decided on my more compact version, which was fortunate for Bill and me. Fortunate, I say, because the problem of fitting the track into the building was not yet solved. The control tower position was a factor in the choice also. My final Space Port model, at a larger scale, was photographed for the annual report. The man reviewing the model for this purpose was James Stewart from the Studio. The model was incomplete. Of all the spherical liquid oxygen tanks, only one or two were gold, the rest were gray. The gold ones were actually the bottom half of L'eggs pantyhose containers. I explained that the two were all I had. He impatiently said, Buy more! The result was that my wife had enough pantyhose to last her for a year. 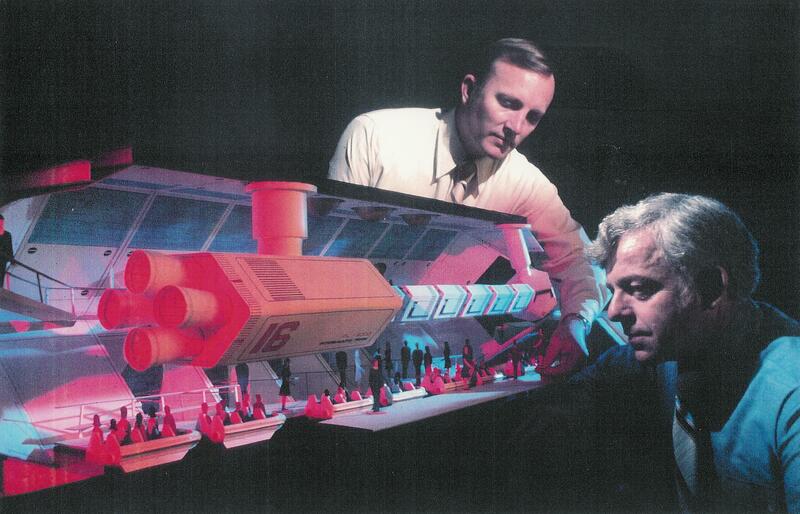 Glenn Durflinger (left), who led the team of architects producing construction drawings, and George McGinnis, Space Mountain concept designer, review the final Space Port concept model. Photo courtesy of George McGinnis. The 200-foot-diameter clear span building alone was estimated to cost one million dollars. This changed a bit when Bill needed more space for the track. The Architecture Department's plan had reduced the available space in the building to 140 feet diameter at the lowest level. This, in turn, reduced available space for ride track, as did the massive Space Port structure. It became necessary to carve additional floor space out of the surrounding below-ground-level embankment for Bill's ride track. This impacted the building foundations and they required additional cement pumped beneath the piers. In this way and others, Bill solved the ten pounds of 'stuff' in a five pound bag problem. Kind of like Alexander the Great when he solved the Gordian Knot. All later Space Mountains were built at ground level eliminating such foundation problems. Bill Watkins tells his story of designing the track.